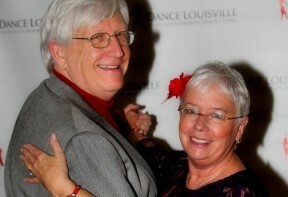 Ballroom Dance Lessons In Louisville! Taking ballroom dance lessons is a great activity for singles and couples alike. 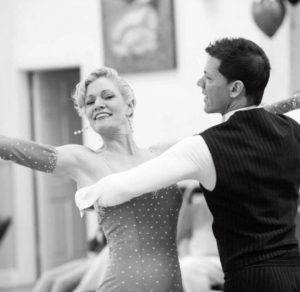 Ballroom dancing can provide a way to learn a new skill, meet new people, stay in shape and keep even your mind sharp. If you have ever been inspired to perform or compete of course there are opportunities to do that as well. We have group and private lesson options so no matter your schedule our budget we have your covered. We also know that taking dance lessons can be a new and sometimes intimidating challenge so promise to take great care. Just get started! 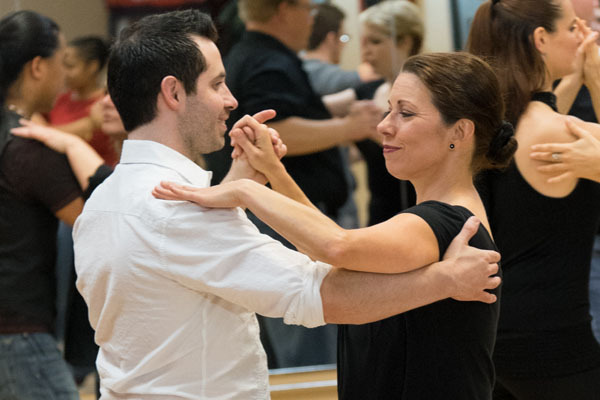 Why Should You Take Ballroom Dance Lessons? YOU′ll LEARN FASTER: Private lessons will allow you to progress at your own pace, whether it be fast or slow. You will find that you’ll progress at the fastest rate in private lessons. SCHEDULING IS REALLY EASY: Private lesson times are available at the studio from 9am to 10pm, 7 days a week! LEARN EXACTLY WHAT YOU WANT: You can try different dances through your private lessons and switch it up as you go. FIRST LESSON FREE: Thats right your first lesson is on us. This way you can make an educated choice to if we are the right studio for you! You are only new the first time! Shoes with non-sticky rubber soles are best. Closed toe shoes are best for ladies. You can start with Group or Private Lessons! You can chose to start with group or private lessons! Some people prefer to start with group lessons, others with private lessons. We recommend starting with a FREE 30min private lesson. Its the best way to get comfortable with Dance Louisville and heck its free so what do you have to lose. We have group classes 4-5 days a week. You can learn waltz, foxtrot, tango, cha cha, rumba and swing. We also have Salsa & Bachata or West Coast Swing and Two Step. Anything you want you can learn! Group classes start at about $10 per class but there are unlimited monthly options as well! Private lessons are the best way to learn on your own schedule and at your own pace. The average person take about 1 private lesson per week. We have private lessons available in 30 & 60 min blocks. Your first one is FREE and it the best way to get introduced to Dance Louisville! Social dancing is the best way to practice your steps and get some fun time on the dance floor. We have a practice party every Thursday and Friday and Saturday dances several times per month. The studio also takes weekend trips to cities around the midwest for even more dancing! – The forerunner of waltz was Boston, a dance imported from the USA and introduced in England by a very influential “Boston Club” around 1874. However, only after 1922 did this dance become as fashionable as the tango. The strange thing about Boston was that couples danced next to each other, nothing like what we do now. Immediately after World War I the waltz got more shape. In 1922, when Victor Sylvester won the championship, the English waltz program consisted of not more than a right turn, a left turn and change of direction. Thats less than what you would learn in a beginner ballroom dance lesson today! – Tango was first danced in Europe before World War I. It originated from Buenos Aires, Argentina where it was first danced in “Barria de Las Ranas,” the ghetto of Buenos Aires. From 1900 onward, several amateurs tried to introduce the dance from Argentina to Paris without success. Being rather an exotic dance, a sensuous creation of Southern nations, the tango initially did not become accepted by the European social establishment. Tango’s breakthrough came in a dance competition on the French Riviera. The dance was so well presented by a group of its enthusiasts that it gained immediate recognition in Paris and then the rest of Europe. – The foxtrot, a dance born in the twenties, was named after an American performer Harry Fox. Initially it was danced at 48 bars per minute tempo. The tempo issue led to the breakaway of quickstep at about 50 to 52 bars per minute and the continued slowing down of pure Foxtrot to 32 bars per minute by the end of the twenties. At the end of World War I the slow-foxtrot consisted of walks, three-steps, a slow walk and a sort of a spin turn. At the end of 1918 the wave arose, then known as the “jazz-roll.” The American Morgan introduced a sort of open spin turn, in 1919. In 1920, Mr. G.K. Anderson introduced the feather step and the change of direction, figures you cannot imagine today’s foxtrot without. The thirties had become the golden age for this dance. That is when Foxtrot tunes became the standards of its tempo. – Developed during the World War I in suburban New York, initially performed by Caribbean and African dancers. It eventually made its debut on the stage of American music halls and immediately became popular in the ballrooms. Foxtrot and quickstep have a common origin. In the twenties many bands played the slow foxtrot too fast, which gave rise to many complaints. Eventually they developed into two different dances, slow foxtrot tempo has been slowed down and quickstep became clearly the fast version of foxtrot. The Charleston had a lot of influence on the development of Quickstep. -The Viennese waltz originally comes from Bavaria and used to be called the “German.” However, other people question this origin of the Viennese waltz. Presumably this is a dance in 3/4 rhythm, which the French regard as the forerunner of the Viennese waltz. My wife and I are looking for an activity to get out and have some fun. We’ve talked about looking for some ballroom dance classes for some time. Are there specific days that ballroom dance classes are offered? Of course the $$ as well for a couple. Thank you! We would love to help take care of you! I am a student at Spalding University I the Occupational Therapy program. For our intro class we were told to choose an activity that you have never done before but have always wanted to do. I have always liked ballroom dancing and would like to use this experience for my project. We have approximately 5 weeks to learn a new skill/activity and present on it March 6, 2018. I do not want to spend a ton of money on this and I can’t commit an extreme amount of time to learning but I would like to learn enough to use for my project. What are the days and times of the classes and how much is it for group classes? Also, are there specific dances taught at each lesson? I would commit a minimum of 6 hours to learn some basics that you could use for your project. I have a Groupon for a month of classes. How do I sign-up? 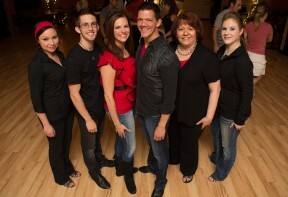 I would like to do Ballroom classes and Group classes. How do I sign-up? Someone did tell me but I do t k ow where the message is right now. How do I sign-up? Please email me to set an appointment. I’m interested and maybe my husband. Thanks!